Kurtis Chong Kee, Danny Delima and Kaua Kaikala kayaked their baits out at Kaupo through rough shore break in order to get their baits in the "zone." Kurtis took his strike at 10:30 p.m. and battled the fish for over 45 minutes before beaching it. They weighed the 117.6-lb ulua at New Maui Fishing Supply. 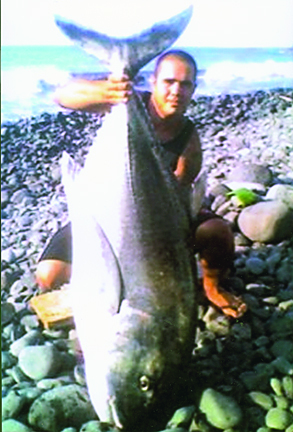 It was Kurtis' third 100-plus-lb ulua of 2010.